Acne is a skin condition that responds well when the correct products are used in the correct manner in conjunction with professional treatments. The Clear Results Acne Program includes a thorough assessment of the type and severity of your acne, detailed treatment plan and customized home care program. The initial visit includes a thorough consultation and treatment. During the consultation your esthetician will determine your skin type, acne type and skin tolerance. Your esthetician will also review aggravating factors that impact the frequency and severity of break outs. Product recommendations for home care will be discussed during the initial appointment. Expect to pay about $150 for your first set of acne home care products at your first consultation and treatment. Assess what type of treatment your skin needs. She will also assess how your home care regimen will be adjusted so that your skin does not over-adapt and stop responding. Perform an acne treatment(s) with extractions. As you get clear, treatments will become shorter – there just won’t be as many extractions to do. 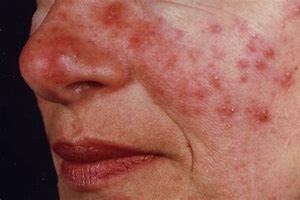 Even though Acne Rosacea is not acne, it still responds to an anti-bacterial regimen much the same as acne. It usually clears up much more quickly than acne and will stay clear as long as product use is maintained.